On a warm summer morning in Binghamton, a student rental house on Leroy Street stood with its basement door busted open, waiting for Hunter Andrasko and his roommates to wake up and discover the break-in. Andrasko, a junior double-majoring in human development and political science, found the scene left behind by a nighttime intruder when he woke up and promptly called his roommates to check on their belongings. They searched the house from top to bottom, and after they failed to find anything missing, called the Binghamton Police Department to report the incident. Andrasko’s experience is similar to those of many other Binghamton University students living off campus. Every year, students file police reports to document thefts from their vehicles and homes. Some also file reports of robbery and other types of property theft. Student-populated areas of Binghamton are not immune to crime, and increasingly, many appear to be targets for thieves hoping to steal expensive electronics and valuables. Across the city, crime rates appear to be falling. According to data from the New York State Division of Criminal Justice Services between 2013 and 2017, BPD reported an 11.3 percent decrease in total index crimes, or the eight offenses that the FBI includes in its annual crime index, including violent offenses and property crimes. In Broome County, total crime dropped by approximately 22 percent between 2012 and 2016. 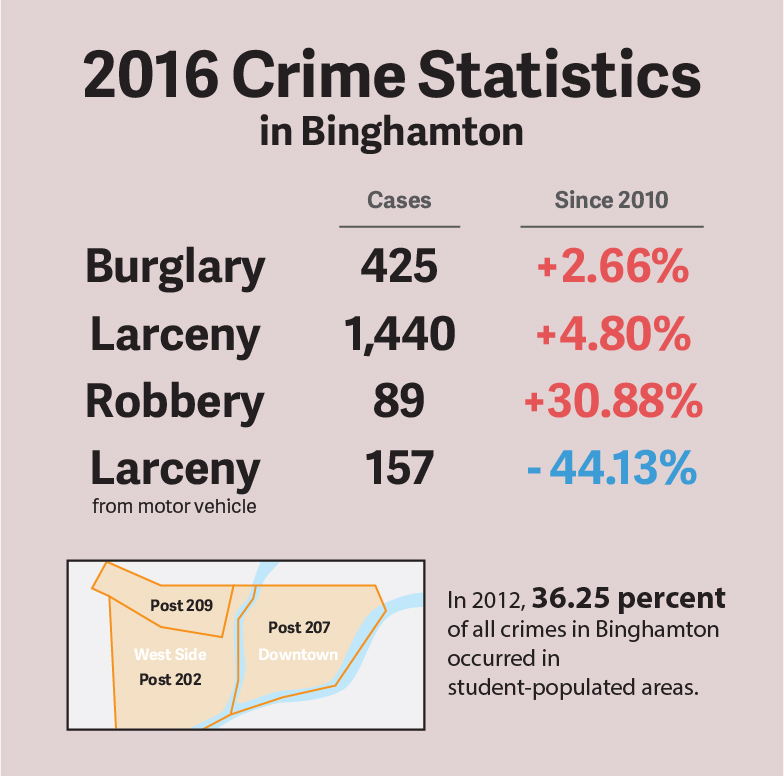 Although Binghamton saw a drop in overall crime, some property offenses are rising, including robbery, which rose roughly 31 percent between 2011 and 2016, according to Binghamton crime reports. Larceny saw an approximate 5 percent increase over the same period, and burglaries rose slightly by about 3 percent. These crimes are becoming increasingly centralized in student-populated areas, including the West Side and Downtown Binghamton. Binghamton crime maps for 2016 show burglaries heavily concentrated in posts 209, which encompasses the area bounded by Main Street, Seminary Avenue, Murray Street and Schiller Street, and 202, which includes the area south of Seminary Avenue between Laurel Avenue and Front Street. In student houses, which are often divided into multiple rooms for several occupants, BPD considers each room in the house occupied by individual students to represent a separate break-in. Therefore, BPD generates different case files for each student in the building. Binghamton’s West Side is also a hot spot for robbery, a change from 2010 crime maps where robbery was more evenly split between Post 202 and Post 207, which spans Downtown Binghamton. According to Chris Governanti, police liaison between the city of Binghamton and BU, students are especially vulnerable to break-ins and thefts over school breaks, as there is an increased chance of students traveling home and leaving their valuables unwatched. Students also tend to see higher rates of theft from motor vehicles left unattended on the street, in parking lots and in garages, especially when valuables are left in view. Governanti said thieves often target houses they believe are empty, as it’s less risky to break into a home that isn’t occupied. Kaitlyn Campbell, who lived in the same house as Andrasko over the summer, said the officer who responded to their break-in told her the intruder probably didn’t realize students were living in the house, as it was under construction at the time, and likely would not break in again. Still, Campbell felt unsafe after the incident. Students are also vulnerable to theft because their rental houses may lack deadbolts and security systems, making it easier to break in without attracting attention. Andrasko said the officer who responded to his house noted his landlord had failed to provide adequate locks on the basement door. According to Campbell, their landlord told them he had never bothered to install a deadbolt on the door because none of his properties in Binghamton had ever been broken into. Although the landlord later replaced the lock and added a deadbolt to the door, Andrasko and Campbell still had concerns about their security. While student populations are especially at risk for property theft, they also contend with other crimes near their off-campus homes. According to 2016 crime maps, aggravated assaults are highly concentrated in posts 209 and 207, and the heaviest concentration of rapes in the city were in Post 209, which runs parallel to Main Street. Additionally, two murders have occurred on Binghamton’s West Side so far this year: the murder of BU nursing student Haley Anderson, which occurred on Oak Street, and a drive-by shooting near Main and Walnut streets that killed Daequan Dickerson, 27, of Binghamton. Over the summer, Andrasko also saw his sedan vandalized after he parked it on his street overnight. He was unable to park it in his driveway because of construction on his house. This semester, Andrasko is living in Newing College, but after his experience living off campus, he said he would not consider renting on the West Side again.